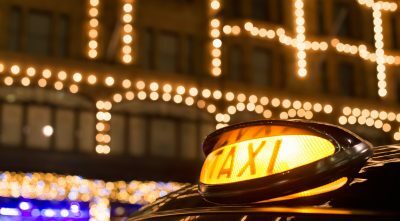 If you want a reason to be able to relax and have peace of mind over the holidays, be aware that we at A Taxis of Bristol, a taxi hire company, will be available throughout the Christmas season. We have a fine reputation for providing reliable taxis that meet the highest standard and are at an affordable price. We are available at any time of the day or night on a regular basis throughout the whole of Bristol. We will be here for any of the requirements of you and your family during the upcoming festive time. Will you attend a work Christmas party where you will want to be part of the fun and activities and yet don’t want to worry about getting home safely? Do you have relatives coming in for a visit who will need transport to and from the airport and also to various attractions? Do you want to attend various holiday events and not worry about where they are located or where to park? When the children are off school, there may be occasions when a reputable taxi and a friendly and concerned driver will be the answer to get them to important destinations. Take high-quality and well-maintained taxis to any points of interest or needed medical or business appointments. Being a family run business, we are proud to share our concern for our customers and our wealth of experience about the area and its businesses and attractions. Combine that with outstanding customer service and competitive prices, and you can rest easy about any transportation needs. For your comfort, you can choose from a fleet that consists of London Taxis International TX-style vehicles that seat five or the Nissan Primastar, Fiat Doblo, Peugeot Euro Taxi, or the Mercedes that are licensed to carry eight passengers. It is also good to know is that here is a helpful taxi service for the disabled. They need to be transported safely and comfortably in well equipped taxis. The drivers have extensive training and the necessary technology to offer excellent service to passengers who have mobility problems. Ramps for wheelchairs are standard. They fold down for use and provide an entry for wheelchair users. Once inside after being assisted by a trained driver, restraint straps make sure that the chair is held securely in place. Also, the passenger is belted in properly.